It’s cold out, finally, it’s been a pretty mild winter so far in Missouri. Now that the holidays are over, and we survived the 2015 Christmas Flood, the weather has turned chilly and there’s talk of snow coming. So now I want to make soups and stews and braises, and curl up with a blanket and a bowl of comfort. 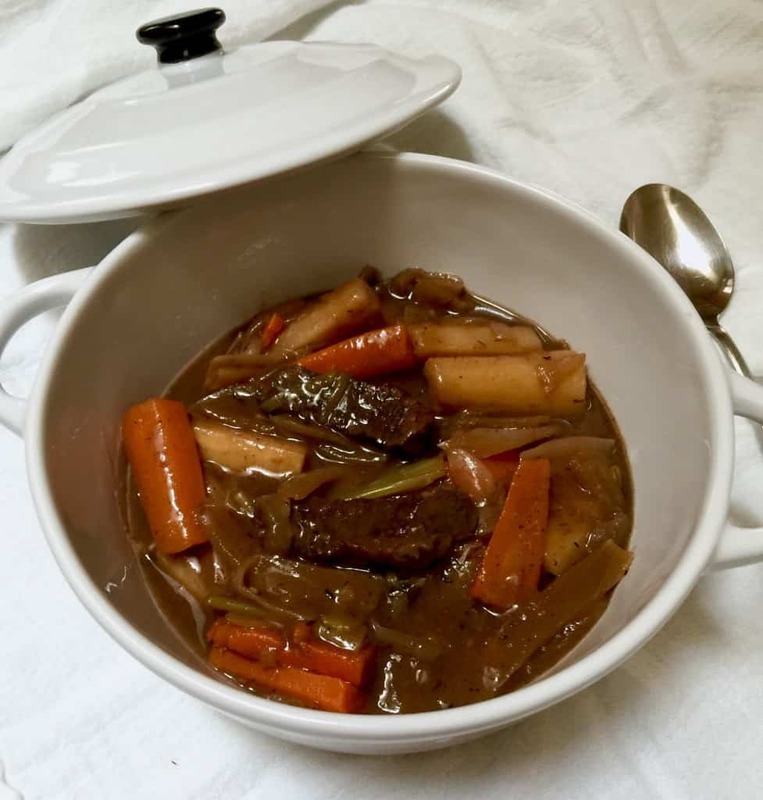 I just made one of my favorites, my take on beef burgundy or beef bourguignon. 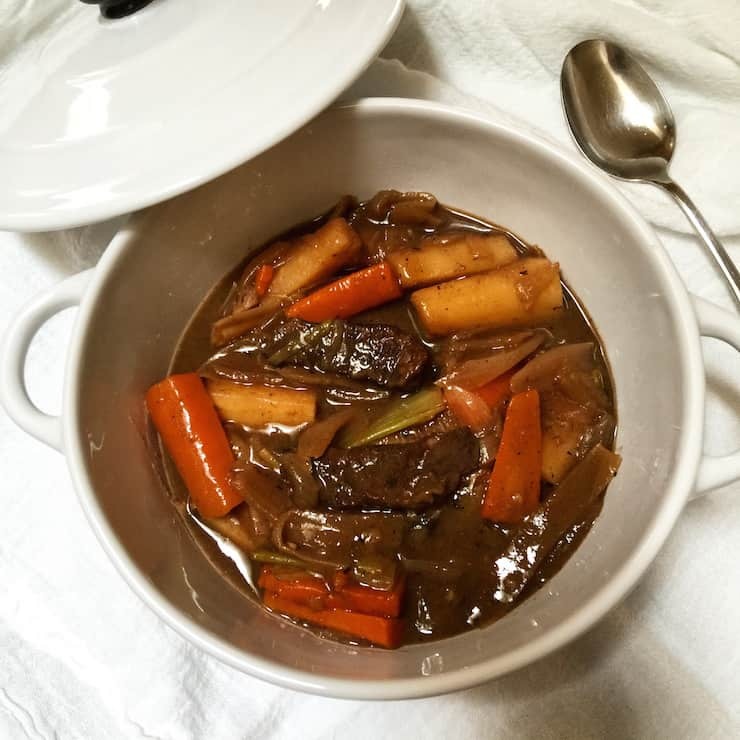 I make a beef stew braised in red wine with caramelized root vegetables and leeks. It is perfection in a bowl in winter. I came up with this stew many years ago, I think I just combined elements from different stews I liked and came up with my version. I tended to make this stew when I entertained, usually around the holidays. As I was thinking about this, I realized I hadn’t made it for several years. Don’t really know why not. Meathead just proclaimed it the best stew I’ve ever made. 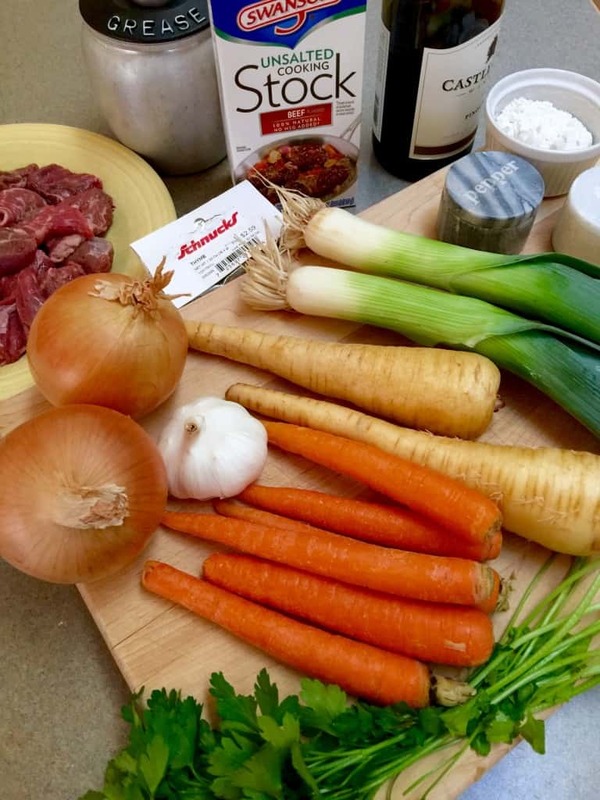 I had most of the ingredients on hand so it was time to make this delicious beef stew again. It starts by browning pieces of beef chuck in bacon drippings, which I happen to keep in the fridge. Most of you will need to fry up some bacon to get the needed rendered fat, and then put the bacon back in later. The onions are next and I like them cut into small wedges. They brown in a little more bacon drippings and then I add some garlic. 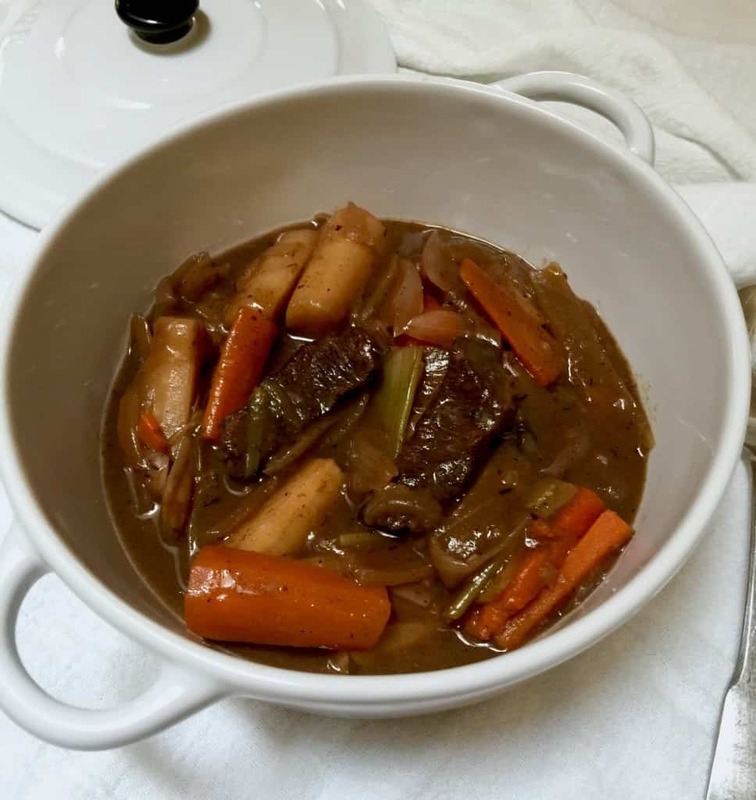 The braising liquid is part beef stock and part red wine. This braises for about an hour and a half before I add more vegetables. 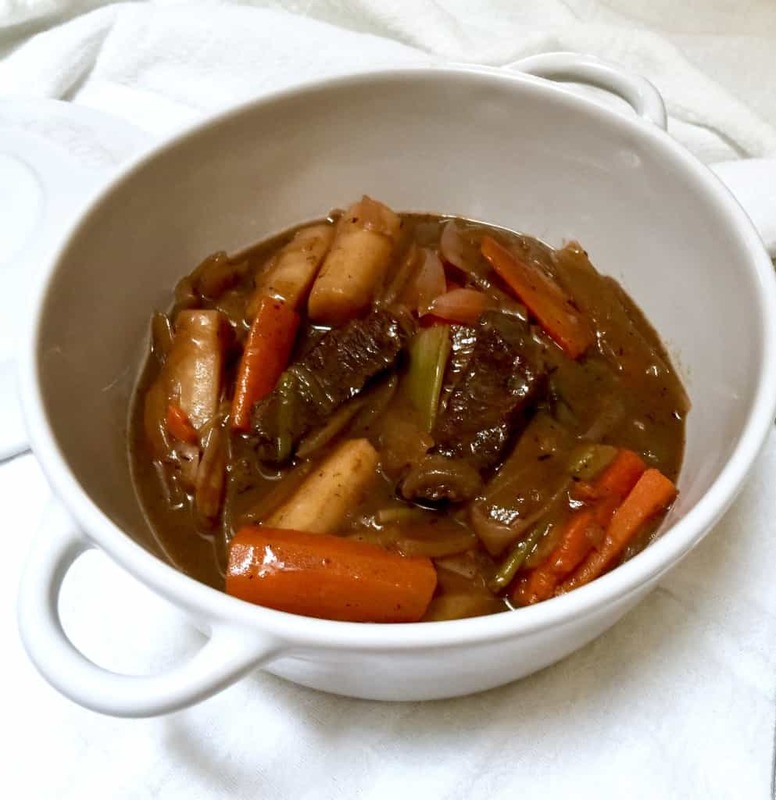 Here’s how to prepare some really tasty root vegetables for this stew. I like parsnips and carrots, and leeks, and yes, I know, leeks aren’t a root vegetable. I cut them into approximately 1½-inch pieces/chunks and toss them in a large pan with some more bacon drippings. Then I sprinkle them with about a teaspoon of sugar and cook and stir until they start to brown and caramelize. 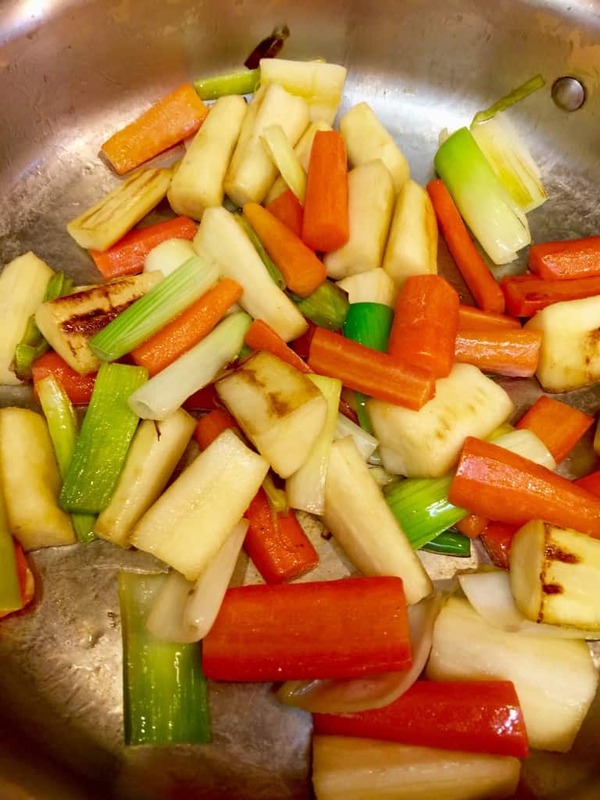 About 20 to 30 minutes before the meat is done, I add these sweet, browned veggies to the pot. The reason I have bacon drippings is that my mom gave me her bacon grease container that I remember from my childhood. It has a strainer in the top and you just pour your bacon grease in and the black stuff stays in the strainer and underneath you have clean bacon drippings, or grease as they say. So that’s what I used, I didn’t have any bacon, no worries. 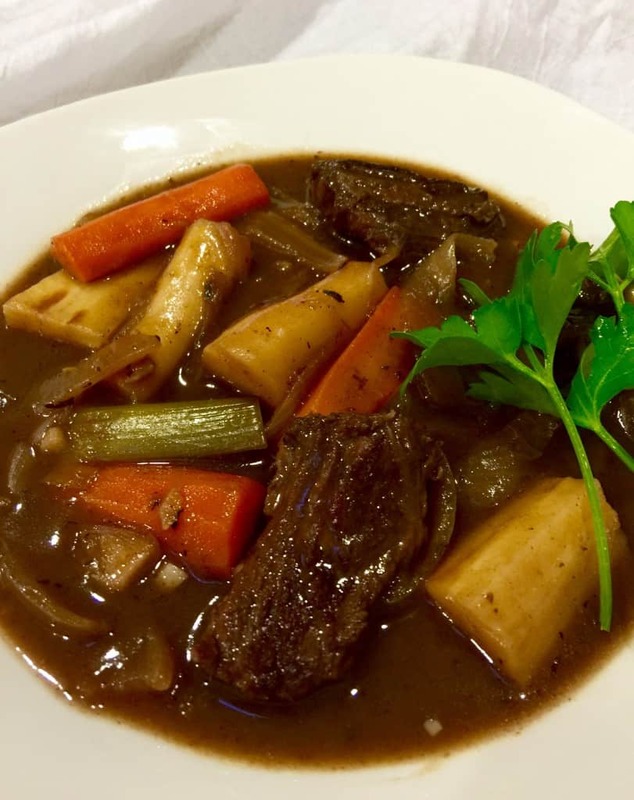 This beef stew with red wine and caramelized root vegetables and leeks is really, really good. The sauce is divine, be sure to spoon as much as you can over your meat and veggies and buttered egg noodles. Make a pot on a cold weekend for Sunday dinner, I guarantee it will warm you up. Pat meat dry with paper towels. In a large dutch oven, add 1 tablespoon olive oil and cooked the bacon until crisp and fat is rendered. Remove the bacon with a slotted spoon to a plate and set aside. Remove bacon drippings to small bowl. Return 1 tablespoon of fat to the pot. Sprinkle dried beef pieces with a little salt and add in a single layer in the pot. Do not crowd the meat and brown in batches. Brown beef well on all sides and then remove to plate with the bacon. Continue browning meat, adding a little bacon fat if needed. Remove all meat from pan. Add 1 tablespoon bacon fat and then the onion wedges. Sprinkle with a good pinch of salt. Cook and stir until golden and lightly browned, scraping up any bits as you can, about 5 minutes. Careful not to burn. Add a little beef stock if needed to deglaze the pan. Add the garlic and cook until fragrant, about a minute. Return the browned beef to the pan and sprinkle the flour, salt and pepper over the top. Cook and stir to incorporate and brown the flour lightly, about 3 minutes. Pour the broth and wine in the pot, adding more of either so the meat is just barely covered. Stir well and scrape up any browned bits from the bottom of pot. Stir in parsley and thyme and bring to a boil. Reduce heat to very low, cover tightly, and simmer until meat is almost completely tender, stirring occasionally, about 1½ hours. Alternately, you can cook in 350º oven, covered, stirring occasionally. In a large sauté pan, heat 1 tablespoon more bacon fat. Add carrots, parsnips and leeks. Toss to coat and then sprinkle with 1 teaspoon sugar. Cook and stir until starting to brown and caramelize, about 10 minutes. Remove from heat and set aside. When meat has cooked an hour and a half or so, add the vegetables. 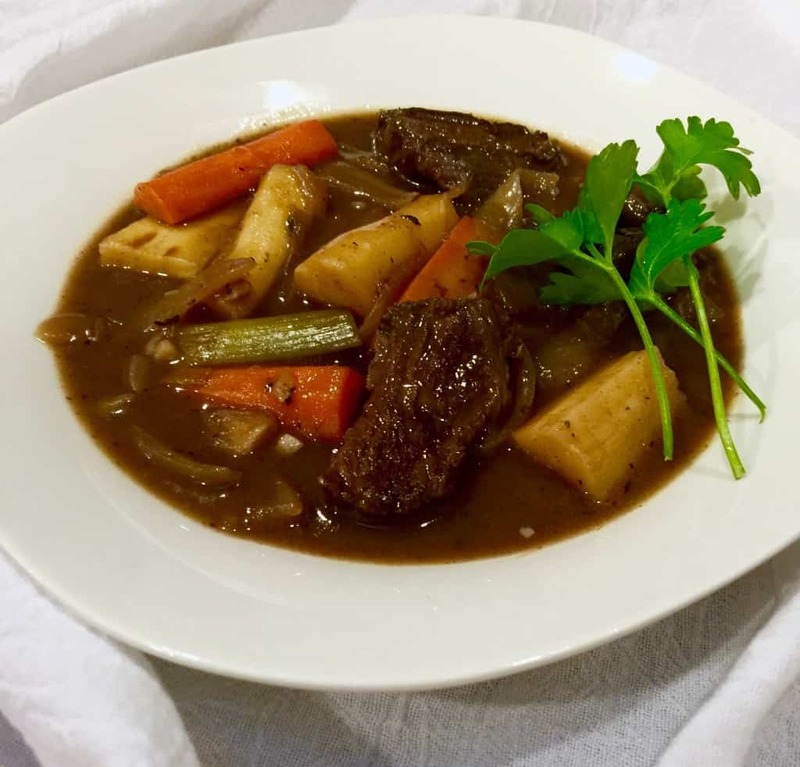 Stir and continue simmering until vegetables and meat are tender, about 1½ to 2 hours total. Season to taste with salt and pepper. Serve over buttered egg noodles.